Join the Rebels as they fight to steal secret plans to the Empire's ultimate weapon, the Death Star, with the Star Wars Rouge One Peel and Stick Wall Decals. The wall decal set comes with 20 wall stickers designed with fierce scenes from the movie Star Wars: Rogue One. 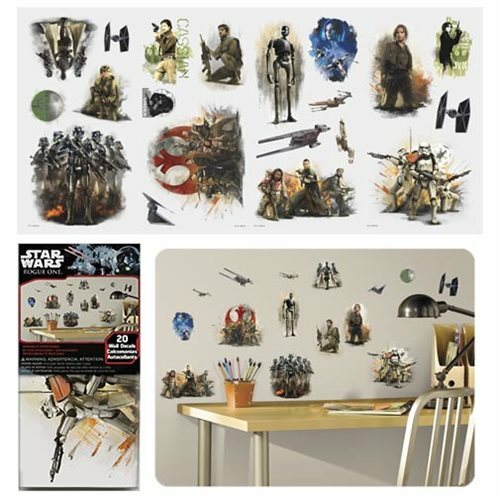 The perfect gift for Star Wars fans of all ages, use these wall stickers to decorate bedrooms, rec rooms and much more. To apply, simply peel and stick. Add these adventure-filled walls stickers to your room decor today! Comes with a total of 20 individual decals that measure from 1 1/2-inches wide x 3 7/10-inches tall to 8 9/10-inches wide x 10 1/5-inches tall.